Jackie Stewart himself answered questions from us wee Jalops today and it was amazing. Not only did we learn more about F1 behind the scenes and his thoughts about the sport today, we also learned interesting details about this great man. He has no hard feelings towards the Ford Tempo. He uses a Lexus as an office, presumably because the wood is so nice. He thinks the men of F1 know their way around a woman. Sir Jackie just knows so much. So COTD has been turned over to some notable moments from Jackie Stewart today. You ask great questions. Sir Jackie, in addition to being one of the greatest drivers in motorsport history and having some of the greatest sideburns in motorsport history you are, as mentioned in the intro, famed for your passion for increased motorsport safety. What safety advancement that you helped bring about are you most proud of, and what area of safety do you think still needs more work today, either in F1 or in another form of racing? One was the Armco barrier, second medical aid, because the chief medical officer at Brands Hatch was a gynecologist. I'm sure he was a good doctor and good at gynecology, but it wasn't the work that would be good in a racing accident. A lot of F1 drivers were already amateur gynecologists. More influence from current drivers on important changes would be helpful. These guys are actually out there, a computer sim is all well and good, but a driver really knows what to do. It's an honor to speak with you Jackie, my question is of a historical one. Back in your era of Formula One, how did an individual advance to F1? Today we have Karting and all sorts of feeder series leading there, and I understand it was quite different back then. Was it as expensive to get to F1 as it is today? By being spotted in the same was as baseball, basketball, etc. You have scouts that go out, and if they see someone come along that's outstanding, you get a chance to drive something higher up, then more scouts come along, then you got into support events. I was a mechanic. I left school at 15 without an education, I'm a dyslexic. I was preparing cars for a very rich young man, who had a family trust that wouldn't let him drive. He had other people drive his cars in small event. He gave me a chance to drive as a reward, I finished second in my first event and first in my second. Sounds like a good idea to me, but I've got two children and a wife of 51 years, and I have 9 grand kids. I can't afford another birthday. 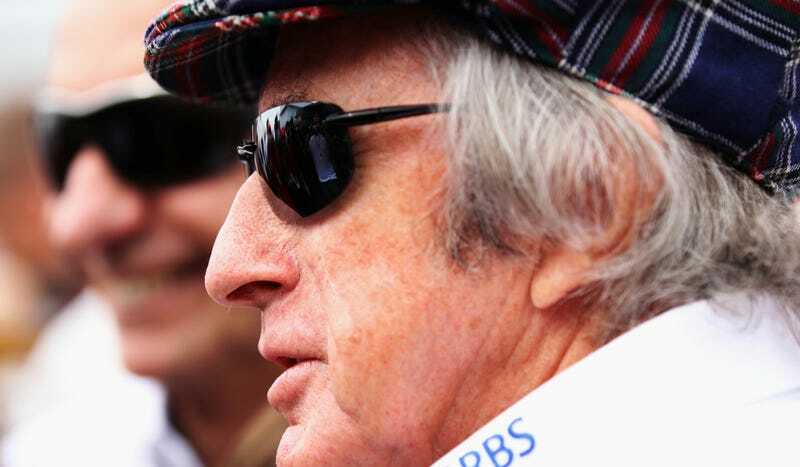 Sir Jackie Stewart, did you ever urinate one's pants due to the sheer power and lack of control in those F1 cars? Nelson Piquet was the champion pee-er. It's to do with the nervous system. Every driver leaves the car to go for a pee. Francois Cevert used to please the crowd by having a pee in front of the main grandstand. Do you regret the Ford Tempo commercials? And thanks for being so awesome . . .
No, it was one of a group of cars. I was involved in so many different ways with Ford. I was in R&D, developing vehicle dynamics, commercials came with the rest of the package. Do you own any of your former race cars? What else is in your garage? I gave my Tyrrell Ford from 1971 to my son Paul and I gave the last world championship car, the Tyrrell 006 to Mark, my younger son. And I have five or six Stewart Grand Prix cars still. Currently I have a Lexus that I'm driven in, use it as an office. I have a Ford Focus. I have a Range Rover too, diesel, it's very good.